Investing in cartoon art education immediately came to mind recently when I was asked by someone how graduates find work. A mother of a recent graduate from the Art Institute Of Minneapolis had a daughter graduating with a Bachelor Of Arts in animation. She showed me her reel which displayed a lot of talent and polish and it is impressive. The basis of her email was to ask if I can recommend how she find work. I couldn’t assist much since I am an illustrator / cartoonist and really could only advise what I would do if it were me. We exchanged information and I gave her as many tips as was possible. I finally implied without being to nosey if she could share what her daughter’s tuition costs were for attending and I almost fell over…..$100GRAND and this school did not set aside any assistance in job placement or have a day set aside for graduates to mix with potential employers like many schools do. The brits call it “gobsmacked”….really, I cannot fathom being so young and having such a huge financial debt, not to mention she just got married plus had just “bought” a house – I use that term loosely (bought) as most banks don’t just allow you to to buy anything based on what their current financing terms are. It brought to light some recent conversations I’ve had with fellow creatives and many of them shared their own thoughts on the value of art school. To follow are just a few bits and pieces of what light has been shed on this nerve wracking topic. Of course any cartoon art education investment is worth it. It teaches you the fundamentals of art and creativity. And you receive a tremendous amount of information from very talented artist who are teaching the classes at your school. And a degree or certificate helps you when you are applying for a position. We all work in a very competitive business, and the more you know puts you heads up over everyone else. Whenever it comes to career directions you should always take the time to pursue information from those in positions to hire and companies you can imagine working. There is a book out there call “What Color is Your Parachute“, it provides some really good thought provoking work to help you ferret out your true direction. Also, the most valuable part is the instructions on doing an “Information Interview/search”…go seek out the individuals and companies and just ask questions, not for a job, find out what they are looking for in an employee. Don’t trust the schools on this note, they are selling education not job placement. I am just worried about going into a lot of debt. I know when I am looking for jobs, a lot of them either want work experience or a degree. I think it may be worth it to just see if I can do some kind of work where I’m not paid but I can learn the ropes. School would be fun and I would for sure become a better artist… I’m just worried about all the money I won’t for sure be able to pay back off an artists salary. I worked at part time jobs and picked up free lance work while going to school. It was not easy by any means, but it worked out. And I enjoyed working as a Advertising Artist & Cartoonist, self employed for 35 years. Go for it, and stay with it. You only go around once in life. I believe there are Talented artists as well as Interested artists. Both need relevant schooling to boost there skills. There would be bundles of talents to relate with and a very healthy competition that keeps you working; and what of the joy of leading others in drawing or illustrating. more so, if you think you are the best and you now come across some whose works would force your mouth at the position of “WHOA” that is life. Okay, I’m going to offer the flip side of this debate. I took art classes in college but graduated with a degree in business administration with an emphasis on finance. Don’t be impressed. I don’t think I learned a thing from that degree that applies to running my own business. I started out majoring in math with the aspiration of being an actuary. That sounds impressive too, but in advanced calculus, I discovered the people around me loved math a little too much to suite my tastes. Regardless of my education I pursued my passion and from that pursuit I learned how to cartoon. Cartooning is seeing life through a certain filter and translating that into a drawing with humor. How in the world can anyone teach you how to do that? It has to come from within, a self-motivated exploration. It’s about as personal of a profession as you can get. Yes, you can learn the tools: the right brushes and the right paper … or on computer: the right tablet and the right software, … but to truly become a cartoonist, you have to discover that for yourself. Art school can have benefits, but no guaranteed benefits. Later when looking for work, a lot depends on the company doing the hiring. When I was Art Director, I interviewed 100s of job applicants for freelance positions. I never asked if they attended art school, or even college. Over the course of time when working with them, I would find out and it turned out that at least 50% had never gone to art school. So, in my case, it didn’t matter at all. I hired for factors which schooling didn’t really matter. A lot depends on personality. Do you have good work habits? Can you deliver on deadline? Do you need outside factors which make you produce, or can you produce on your own? Art school might help develop good work habits, or not. That is what is important to most who do the hiring. As for skills and abilities, those are developed with experience, whether you go to school or not. I’ve worked professionally for several decades and can honestly say that no more than 20% of my skills (maybe far less) can be attributed to what I learned at art school, the vast majority of my abilities are due to experience; reading and staying current on technology updates; experimenting and pushing boundaries; and just getting out there and doing it. There are many other personal factors to take into consideration. Will you be comfortable with huge school debt, and will you pursue specific cartooning fields that can produce the type of income which will pay those debts? Her response was “I don’t want to work for Disney or any other big company like that! I just want to paint on my own.” With advice from several successful professional fine artists, she decided not to attend. Look at the whole picture and if everything points in that direction, go for it. Enjoy the benefits of what others have mentioned here pertaining to art school. Take it seriously. You are not going to art school to party… no matter what your classmates might be doing. You are investing several years of your life and extreme mega bucks… make it pay off when you graduate! 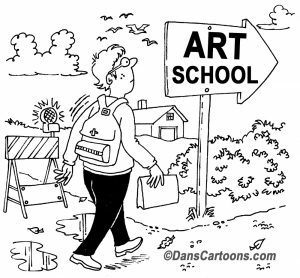 I did attend art school but learned most afterwards just doing it..developing working habits and keeping up on technology etc which can often be found in short courses and workshops or in reading up and about other cartoonists and illustrators. Never have I been asked by a publisher…which art school did I attend…one actually told me to let go what i learned at art school and find my own style. 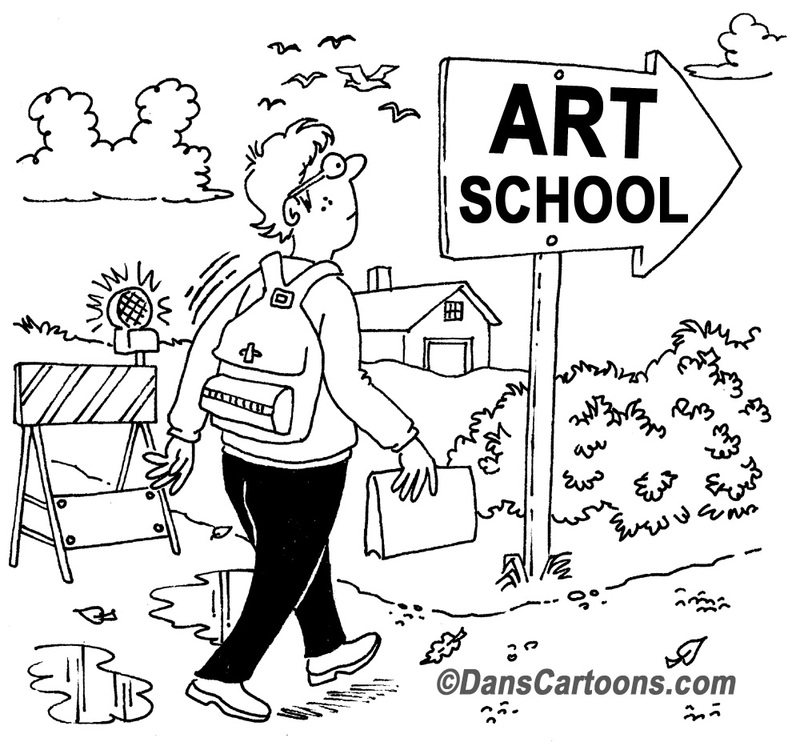 My own personal views on a cartoon art education are mixed. I personally couldn’t afford any kind of cartoon art education or schooling that I felt would assist in providing additional knowledge regarding my interest in cartooning. I didn’t expect my family to pay that so I took an alternate route and chose to get my work published directly and it certainly wasn’t easy but it didn’t take long for my work to start popping up in various magazines and that initial exuberance resulting from a steady stream of modest sales kept my creative drive and energy at an optimum level. An optimum level that I learned from in various ways, such as how to market my work in a professional way, how to accept rejection and learn from it, how to continue to develop and refine my own distinctive cartooning and drawing style, maintain a reliable record keeping system including several other factors that no art school could have instilled in my young impressionable mind. A creative mind has to have a characteristic attribute where they realize what they truly want. Many art school graduates get disenchanted and meander into other endeavors….simply because they didn’t possess that inherent artistic vision. 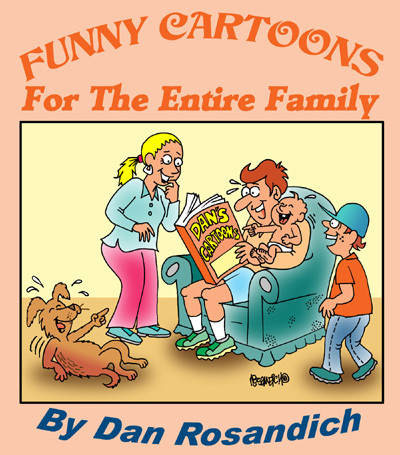 Cartoon artist jobs are still plentiful in the world of cartooning. It’s dependent on that specific individual to find themselves work or generate their own assignments that can be considered conducive to the rates compared to the current cartoon artist salary fees generated today. Be certain you have that vision what you want to be!